1838-1853 brought us the Liberty Seated quarters. Most of these were minted in Philadelphia, San Francisco and New Orleans, but Carson City started minting them in 1870 and they are all rare, especially the 1873CC which there are only 5 known. America made a Twenty-Cent Piece from 1875-1878. They were a short lived denomination as the public often confused them with the quarter (much like the Susan B. Anthony dollar was mistaken for a quarter). There was also the fact that there were Fractional Currency Notes being used on the eastern U.S. and we really didn't need a substitute for two dimes. Bust quarters ran from 1796-1907. The first few years had no denomination indicated, in 1804 they added the value 25c. This design, like the dimes, was followed by the Capped Bust from 1815-1838. 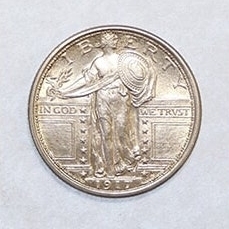 The Capped Bust quarter came in 2 sizes, the larger variety 1 and the smaller variety 2.